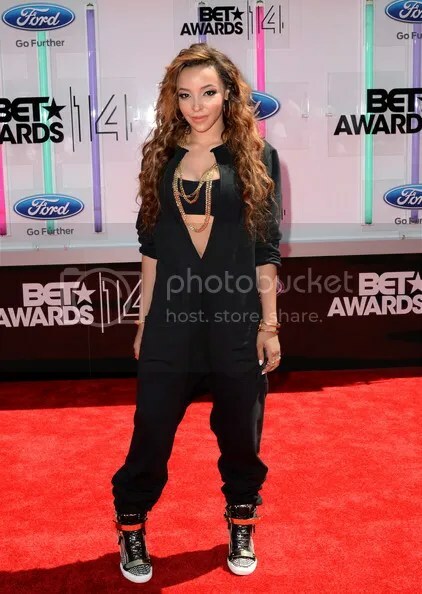 The 2014 BET Awards happened last night at the Nokia Theater in L.A. and the red carpet was red hot with these looks from the ladies. Check them out below! Adrienne Ballion looking gorgeous in a white gown with her signature top bun and red-orange lipstick. “Think Like a Man Too” beauty, Regina Hall is killing them in a white pant suit, black sandals and natural makeup. Kerry Washington makes her first televised appearance after giving birth to baby Isabelle two months ago. She looks stunning in a short floral number and white pumps. Tameka “Tiny” Harris looks good in a black halter-style dress with scalloped layers, sliver flowers and gladiator pumps. Interestingly, she hit the carpet solo (with a naked ring finger,) but hubby TI was in attendance. Lil Mama is working this orange mini dress and blonde hair. I love it. Magic Johnson’s daughter, Elisa Johnson worked her magic on the red carpet in a black Chanel pant suit. R&B starlet-in-the making, Tinashe was “2 On” as she strolled down the carpet in her sporty black jumpsuit and high tops. Which one is your favorite? I’m torn! Help me out by weighing in on the fashion in the comments section.